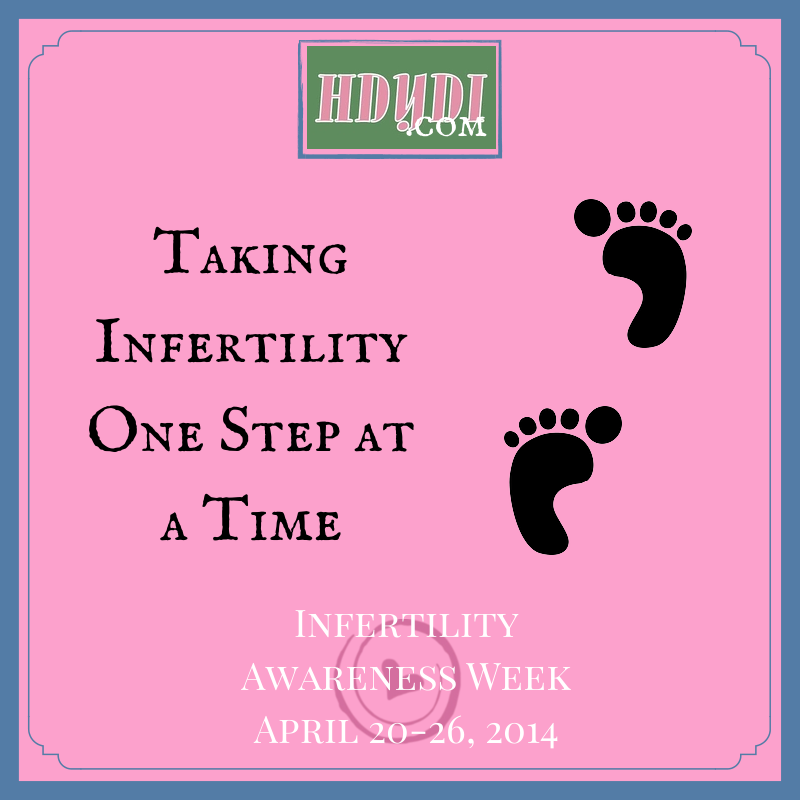 My Story: Taking Our Infertility One Step at a Time | How Do You Do It? I got married young, at 23, but the plan was for us to focus on our careers for a while. We worked hard, and we played hard. We loved those first few years of marriage. As I entered my late 20’s, having been married five years, and having reached a really good place professionally, we started thinking about having a baby. The time was right, and we were ready. As a Type A person, I had everything planned out. I stopped taking birth control in late 2004. We waited a few months to officially start trying, and in the meantime, I stopped drinking caffeine and started eating by the Food Guide Pyramid. I read the book Taking Charge of Your Fertility [although I skipped the chapter on infertility; that didn’t apply to me]. I was charting my cycles, taking my temperature each morning. I wanted to be pregnant by the time I turned 30, in February 2006. After charting my cycle for a few months, I noticed my cycles were really long…55 to 60 days. I didn’t want to believe anything could be wrong, though. It was just my body adjusting to being off the birth control, right??? The books said that a woman at my age should be pregnant within a year. I vowed to be patient…but after six months, given what I was seeing with my cycles, I made an appointment with my OB/GYN. He ran some preliminary tests, and my husband had a sperm count done. Everything checked out, so my doctor put me on Clomid. Again, I vowed to be patient, not to stress about it. It would happen, right??? After six rounds of Clomid, my OB/GYN referred me to a reproductive endocrinologist in the nearest metropolitan area, about 75 miles away. I got to know every stretch of that 150-mile round trip all too well. During my first vaginal ultrasound, I heard the term “string of pearls” said by the technician to the doctor. My heart sank. By that time I’d read the chapter on infertility, and I knew that meant something was wrong. I was diagnosed with PCOS. My husband also underwent more testing. While his sperm count was normal, an SPA test revealed a low penetration rate. The normal range begins at 5.0, and his was 1.7. At least we had a diagnosis, though. It was validating to know that it wasn’t just me “not having been able to relax”. (That makes my blood pressure rise just to type it!) Having a diagnosis meant we could move forward, right??? Psychologically, a big part of my coping mechanism was taking things slowly…believing it would happen for us…forcing myself to step back from the calendar, from my biological clock. In stark contrast to my Type A personality, I vowed to be patient, to go with the flow. Ultimately, we did six rounds of Clomid…then four rounds of Clomid + IUI…followed by three rounds of injectables + IUI…before we considered IVF. I wanted to follow the least-invasive method. We gave it our best shot. With those options exhausted, we met with our doctor and decided that IVF with ICSI was the next step for our family. It was a huge relief to have made that decision. I felt like we had “paid our dues” through the process (part of the psychological game I played with myself). I felt confident. I felt excited. We had a couple of setbacks leading up to IVF. A problem was discovered with my thyroid, and then I had an abnormal blood screening. That was my lowest point. We’d taken all the steps, and then made the Big IVF Decision. I broke down. I went from feeling confident, to feeling defeated. What if this wasn’t in the plans for us??? Although that news delayed our progress for a couple of months, we were able to control my thyroid pretty easily, and the abnormal blood screening turned out to be a fluke. Finally, we were ready to take the plunge in May 2008. We implanted two embryos, and in January 2009, I gave birth to our twin girls. It was a long, hard road. Not only has motherhood changed me, of course, but that experience did, too. I never would have asked for that to be our path, but I am a stronger, more compassionate person because of it. That long, winding road brought us to our children, and we are eternally grateful.